Bringing together entrepreneurs and leading investors to discuss, meet, and collaborate to build great new businesses. 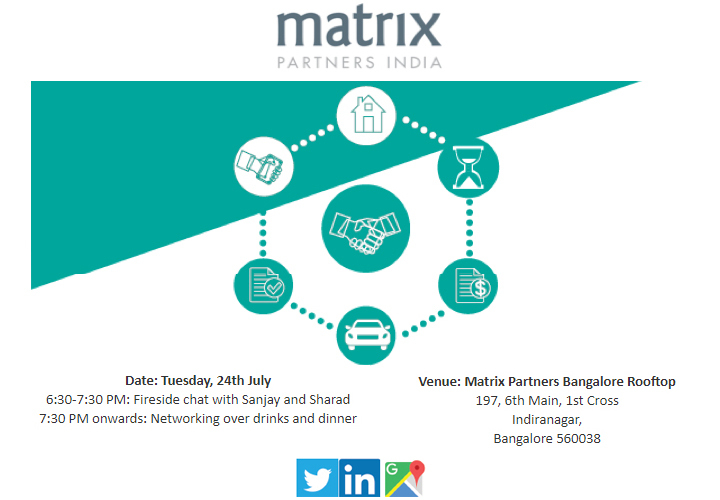 Get all your concerns directly answered via one of the leading investment firms, Matrix Partners. 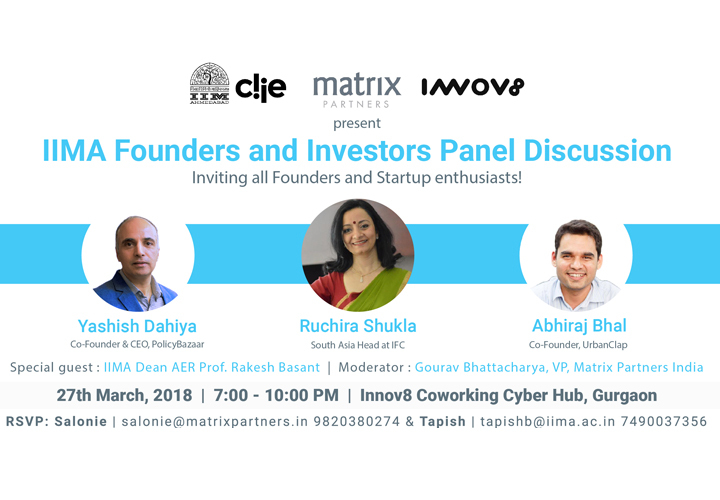 An event held for the IIM A alumni founders and startup enthusiasts, with learnings from Yashish Dahiya, Co-Founder & CEO, Policybazaar, Ruchira Shukla, South Asia head, IFC, and Abhiraj Bhal, Co-Founder, UrbanClap. 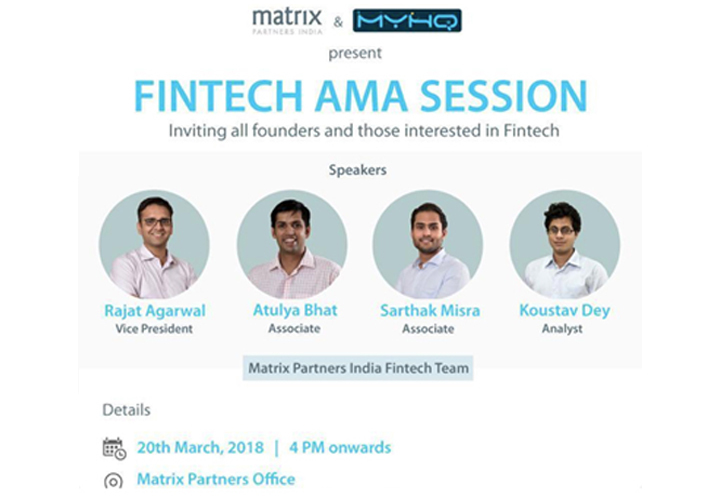 An AMA session with the Matrix FinTech team, discussing emerging trends and opportunities in the financial services space in India, for entrepreneurs and enthusiast in the NCR startup ecosystem. 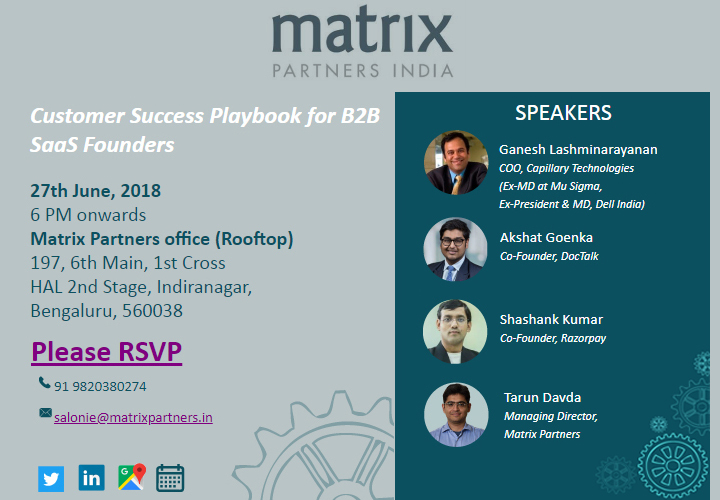 A interactive session held for SaaS founders, with Ganesh Lakshminarayanan, COO, Capillary Technologies, Akshat Goenka, Co-Founder, DocTalk, Shashank Kumar, Co-Founder, RazorPay and Tarun Davda, Managing Director, Matrix Partners India as panel members. 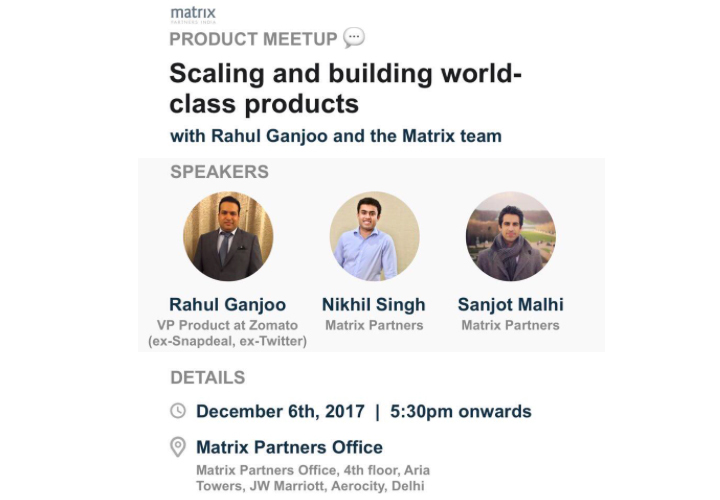 A product meetup at the Matrix NCR office, discussing the scaling and building of world-class products with the Matrix Consumer team. 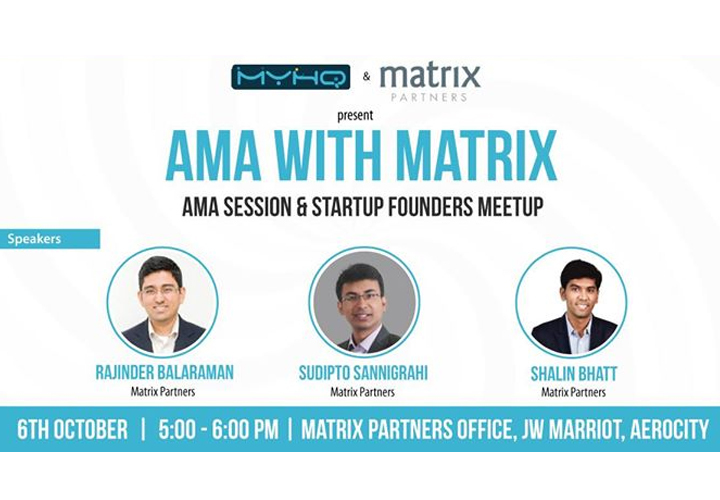 Matrix India hosted a fireside chat with the two firebrands of the financial services world, Mr Sanjay Agarwal, founder AU Small Finance Bank and Mr Sharad Sharma, founder iSPIRT Foundation, India Stack Team. 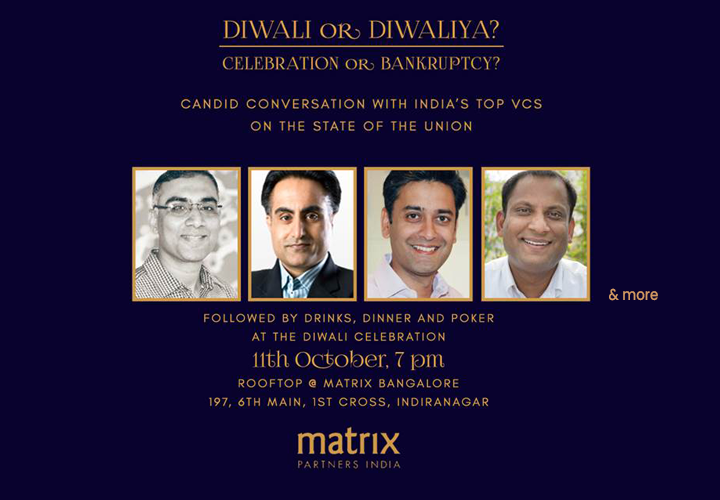 Matrix Partners India's annual Diwali event, the bringing together of India's leading VC's for a candid conversation on the State of the Union, followed by a fun evening over drinks, dinner & poker. 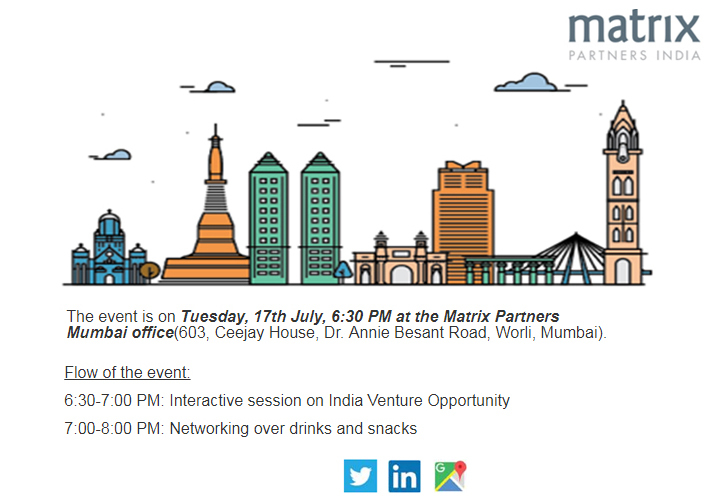 The first of many events held in the new Matrix office in Mumbai on emerging themes and opportunities in the current venture environment, with our friends from the early stage ecosystem including founders, executives, angel and early stage investors. 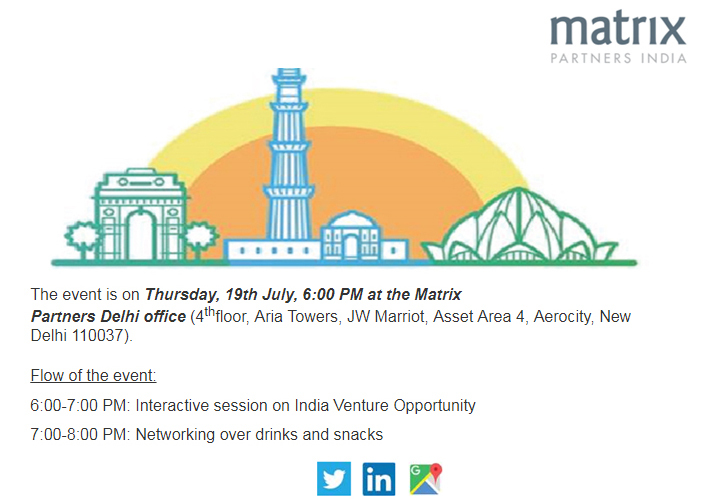 Bringing together key players of the NCR startup community, an engaging session was held on emerging themes and opportunities in the current venture environment, with our friends from the early stage ecosystem.